A-HOTEL.com - Luxury and cheap accommodation in Bukhaidze, Russia. Prices and hotel, apartment booking in Bukhaidze and surrounding. Offering free WiFi and mountain views, Apartment Elbrus is an accommodation set in Elbrus. Guests staying at this apartment have access to a fully equipped kitchenette. Located in Elbrus, Mount & Elbrus provides accommodation with a balcony and free WiFi. Guests staying at this apartment have access to a fully equipped kitchen. Apartment on Elbrus offers pet-friendly accommodation in Elbrus. Free WiFi is featured throughout the property. 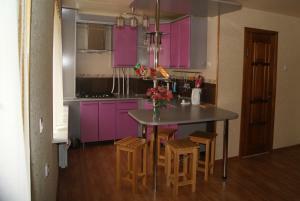 Located in Elbrus, Apartment in Elbrus village offers accommodation with a kitchen. There is also an oven, fridge and a kettle. Featuring barbecue facilities and a terrace, Shaman Chalet near Elbrus is situated in Elbrus. Among the various facilities of this property are a shared lounge and a bar. Located in Tegenekli in the Kabardino-Balkaria region, Дом у Высоцкого has a balcony. The accommodation is 4. Nestled at the foot of the Elbrus Mountain, this hotel features billiards facilities, bicycle rentals and a cosy bar. A free shuttle to the ski lifts and back is also available. Motel_adamas is offering accommodation in Tegenekli. All rooms boast a kitchen, a flat-screen TV with satellite channels, and a private bathroom. Located in Tegenekli, Elbrus HiLoft Hostel features a garden. The property features a bar, as well as a restaurant serving European cuisine. Situated in the Caucasus Mountains in the Prielbrusye National Park, Pik Evropi offers ski equipment hire and a games room with billiards. Free Wi-Fi and ski storage space are provided A TV, minibar and private bathroom with a hairdryer feature in the rooms at Pik Evropi. Offering free WiFi and mountain views, Apartment Tyrnyauz is an accommodation situated in Tyrnyauz. Guests staying at this apartment have access to a fully equipped kitchen. Located in Tyrnyauz, Apartment Elbrusskiy 102 offers accommodation with free WiFi. The accommodation has a sauna. Снежная Вершина features free WiFi and views of mountain in Elbrus. All rooms are equipped with a balcony with a river view. Set in Ksisyuryulgen in the Kabardino-Balkaria region, Дом у горы РУСЛАН has a terrace. Guests have a private balcony. Проспект Эльбрусски дом54 квартира79 is set in Tyrnyauz. The accommodation is 31 km from Elbrus. Boasting ski-to-door access, garden, terrace and free WiFi, Hotel Gorny Rodnik is located in Terskol, 7 km from Polyana Azau and 8 km from Elbrus Ski Lift 1. Located around 4. Offering free WiFi and mountain views, Apartment in Tyrnyauz is an accommodation set in Tyrnyauz. The accommodation is 31 km from Elbrus. Located in Terskol, within 4.4 km of Polyana Azau and 6 km of Elbrus Ski Lift 1, It Call Rooms features a terrace.